1. Stream of consciousness thinking out loud. I read somewhere that toddlers think out loud because while they’ve acquired language, they’ve not mastered it enough to think quietly inside their heads. Charlotte talks constantly, speaking all her observations out loud. 2. Narration and storytelling. In addition to her most private thoughts, Charlotte shares stories constantly. She tells us what happened today and yesterday. She has no concept of verb tense, so we have to figure out historical context. Most recently she remembered that “Mommy took Peter to the doctor,” referring to a rescue mission Charlotte and I made in March when a friend was stranded at a hotel and needed to get to an emergency room. 4. Love of books. She could read all day long. Today’s favorites are Charlotte Doyle’s The Bouncing, Dancing, Galloping ABCs; K. C. Olson’s Construction Countdown; and Jon J Muth’s Stone Soup. 6. Morning piano concerts. “Mommy get coffee and sit in green chair. ‘harlotte play piano.” Every morning. Guaranteed 6 minutes of hot coffee, giggles, and relaxation. 7. Hugs. Kisses. Randomly. All the time. 9. Mommy can do no wrong. For now. I’m savoring this. I know this phase passes quickly and will soon be gone forever. 10. Learning to play with other children, not just next to them. Several weeks ago we went to a picnic for the Chicago Belgian community and Charlotte played catch with another little girl for about 20 minutes. The moms just watched. It was a major developmental moment for us. 11. Doing something “risky” because a friend did it first. Charlotte is a scaredy cat. Seriously. She’s been refusing to go down the slide since May when she went down a hot slide. She doesn’t climb much, and she’s never been interested in the “big girl” swings. Until today. When she saw Sarah on the swing, she was convinced she had to try it. They gleefully swung side by side for 10 minutes. 13. Teaching herself the alphabet and numbers. I realize Charlotte is not a genius, but watching her teach herself letters has been the highlight of the past four months. 14. Obsession with stop signs. We have to talk about every stop sign we see, what color it is, what letters are on it, and what we should do when we see one. 15. Eagerness to please. Again, I know this will pass…. 16. Music. Charlotte literally wakes up singing. Wish I could get it on tape. Typically she wakes up singing “Sur le pont d’Avignon” or “Bon jour, Maman. Bon jour, Papa,” both from her music class. 17. Her pace. Charlotte makes me slow down while she examines a leaf, checks out the texture of a wall, or just sits down. How refreshing to walk at a toddler’s pace and experience her wonder of the world. 18. Growth. Every day. In so many ways. 21. Sense of humor. 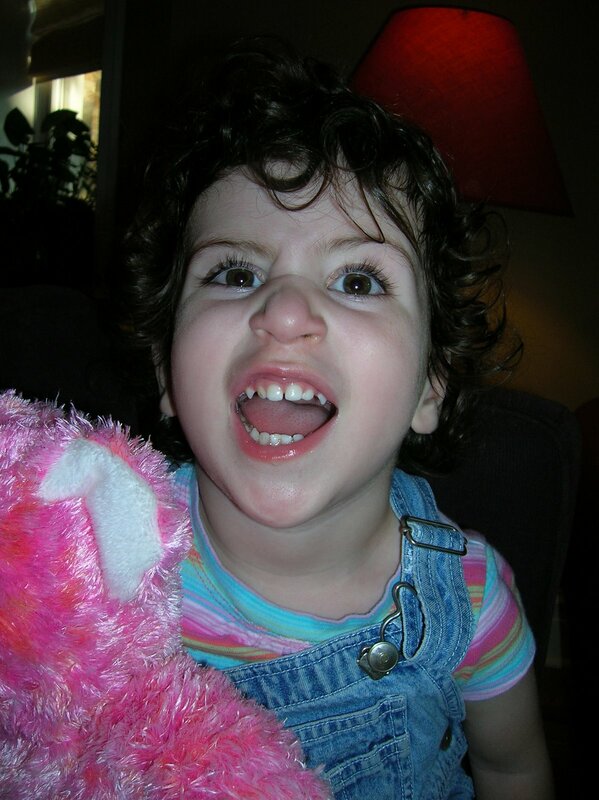 Charlotte has a typical toddler’s sense of funny and she regularly melts into giggles over the silliest things. 23. Acceptance. I don’t know if Charlotte understands that other kids eat everything they are supposed to or that not everyone has a big scar down their chest. She troops to the doctors, does her therapy, and never complains. 24. Boo boo kisses. She gets them. She gives them. She thinks they can fix any and everything. 25. Bubba and Nemo and Kitty and New Puppy and all of Charlotte’s friends. These stuffed buddies are her world. She dresses and plays with them, tucks them in, and hugs them. 27. Pure, unadulterated, unconditional love and affection. 28. Charlotte is my hero. I read a poem recently on a mom’s signature on P2P about exactly this–that our kids look at us and think (when they are two) that we are wise and strong and can fix everything with a boo boo kiss. Would that it were true! I look at Charlotte and know that I will never be as strong as she is. I know that in two years she has taught me more about what is important in life and love than any other person I know. And she continues to teach me every day.